February brings with it Valentine’s Day and the prospect of millions upon millions of flowers being sent to those who hold a special place in the hearts of the people who send them. Indeed, it is estimated that nearly 200 million roses alone will find their way into the lives of “significant others” throughout the United States this year. Flowers are remarkable in many ways, not the least of which is their influence or power over those around them. The fact that flowers hold a special place in the lives of humans should come as no surprise. Flowers have been used by people since ancient times to express their feelings, enhance their surroundings, and commemorate important occasions. For example, in Israel an ancient burial pit dating back 14,000 years was found to contain impressions of stem and flowers from plants such as mint. Later, Egyptians were known to have placed flowers in vases and bowls whereas Greeks and Romans mainly wore flowers in the form of garlands and wreaths. Photographer: Petr Kratochvil. Public domain image. By the time of the Renaissance, flower use had become much more elaborate and commonplace. Flowers were used not only for special occasions such as pageants or feasts, but also for everyday use in homes. Each succeeding era (e.g. Victorian) brought with it changes in flower design and usage. Today, flowers are an integral part of our everyday lives and are used to express various feelings from deep sympathy to abundant joy. Until recently, the unique need that humans seem to have for flowers in their lives had not been investigated in a scientific manner. That changed several years ago when the Society of American Florists funded research to study the effect flowers have on people. The research was conducted at various universities across the United States. Flowers have an immediate impact on happiness. Research participants expressed "true" or "excited" smiles upon receiving flowers, demonstrating extraordinary delight and gratitude. Flowers have a lasting positive effect on moods. Those who participated in the study reported feeling less depressed, anxious or agitated after receiving flowers. Additionally, they exhibited a greater sense of enjoyment and life satisfaction. Flowers tended to make intimate connections between people. The presence of flowers in the surroundings of individuals led to increased contact with family and friends. In a follow-up study on senior citizens, the same research team found that flowers have a significant impact on the elderly. Over 100 seniors participated in the study. Some received flowers while other did not. Their research demonstrated that flowers can help reduce depression, promote social networking and help refresh memory as people age. 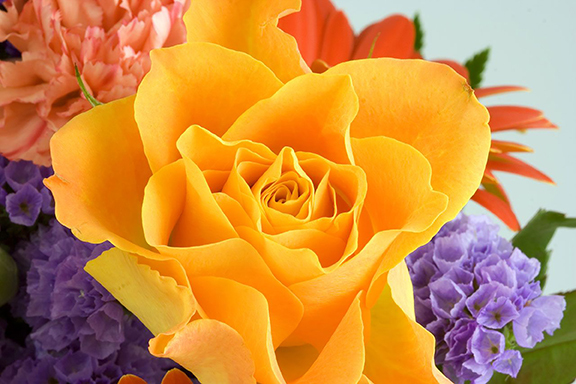 An overwhelming 81 percent of seniors who received flowers reported a decrease in depression follow their arrival. A widening of social contacts was reported by 40 percent of the flower recipients. And, finally, 72 percent who received flowers scored very high on memory tests when compared with test results of seniors who did not receive flowers. The team concluded that a small dose of nature (such as flowers) can do wonder for our well-being as we grow older. Flowers evoke feelings of compassion. Study participants who had fresh-cut flowers in their home environment felt an increase in feelings of compassion and kindness for others. This true even when the flowers were in the home for a relatively short time. Flowers relieve “the blues”. Simply put, study participants felt less negative after being around flowers at home. Flowers placed in rooms frequented in the morning after arising can help to dissipate the “morning blahs”, they concluded. Flowers give people a physical and psychological “lift”. Increases in energy, happiness and enthusiasm at work were reported by those who had flowers in their home environment. Trying to maintain a “competitive edge” in business is important for success. According to experts, maintaining a happy, productive workforce is critical. A recent study conducted at Texas A&M University revealed that Mother Nature just might be the key to a successful business. Research subjects were asked to perform a variety of common office tasks in various workplace environments. Some of the environments included flowers and plants; others did not. Idea generation, creative performance and problem solving skills improve significantly when the workplace environment included flowers and plants, according to their findings. In the study, men generated 15% more ideas than women. However, women developed solutions to problems that were more creative and flexible. Finally, flowers can be very powerful simply because they usually are gifts. In her books, award-winning author M.J. Ryan relates to her readers how acts of gratitude and generosity can result in feelings of increased happiness, health and the sense of being more closely connected with others. In closing, a late colleague once observed how paradoxical it is that flowers are used both to express joy and to offer sympathy. In both cases flowers help to make an intimate connection between two people that often transcends words. The fact that flowers have an immediate impact on happiness and long-term positive effect on mood helps to explain why the advertisement “say it with flowers” is a timeless truism.